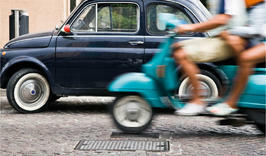 SELF DRIVE VESPA TOUR - Do you like Adventure? You know, When in Rome do as the Romans do! So hop on a Vespa and live your best holiday. You’ll drive by yourself the scooter symbol of the “Dolce Vita” following our guide long the spot where no taxi or Turist Bus can ever enter, to live an unforgettable roman experience! A “once in the life” Rome experience! Self drive Tour - Time 3h - Driver Licence, Credit Card and two wheels driving skill requested -Start 9am-3pm-7pm (3h). ON DAY ON A VESPA - Colosseum, San Peter Basilica, Pantheon, Navona Square, Spanish Steps, Trevi Fountain, Campo de’Fiori Square, Old Via Appia, Catacombs….and 13 Obelisks, thousands of nice fountains, hundreds of churches…visiting Rome you can enjoy the largest art and history concentration in the world, a real open air museum! Would you give the Eternal City the time it deserves? Spend with us one day, decide itinerary by yourself to say, really, I “saw” Rome! Time 8h- Itinerary to be agreed - Start h.10am - Lunch not included - Pick up/Drop off included (valid just fot the option with Driver). 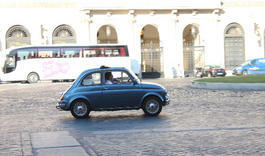 FIAT 500 TOUR - Have you ever thought about watching Rome trough the old Fiat500 sunroof? The old Fiat 500 is the car symbol of the Italian fun spirit. Forget for a while the comfort and enjoy, like a Time Machine, a real italian experience. Fiat 500 whit Driver - Time 4h - Max 2 people per car -Start 9pm-3pm-7pm (3h) - Pick up/drop off in Hotel/Restaurant (within the limitations of the road traffic).